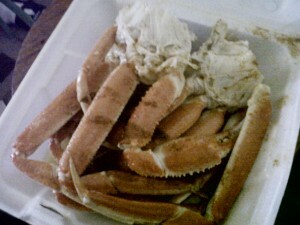 I LOVE crab legs! It&apos;s not something I usually like to order when I go out to a restaurant, though. When I order crab legs I want to eat them and not worry about how messy it is while I&apos;m enjoying my meal. When my son and I get a taste for some delicious crab legs, we usually go to Crab King on Milledgeville Road. We particularly like the Garlic Snow Crab Tray. They have shrimp and fish, and a lot of other good stuff on the menu but, their name is Crab King, and that is really what they do best!